It's been a long time coming. 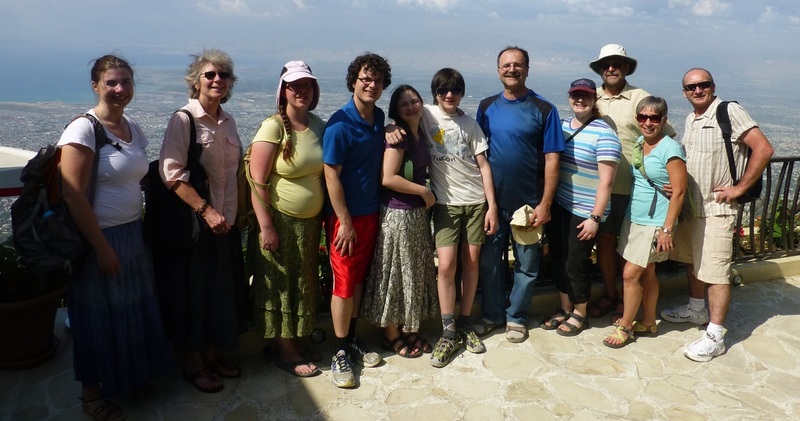 For several years our church has been talking about going on a Work & Witness trip. Being a relatively small church, we didn't know how this would work out. What can we do? Where would we go? How many could come? Who would lead us? All we knew is that we strongly believed that we were to participate on a Work & Witness trip. 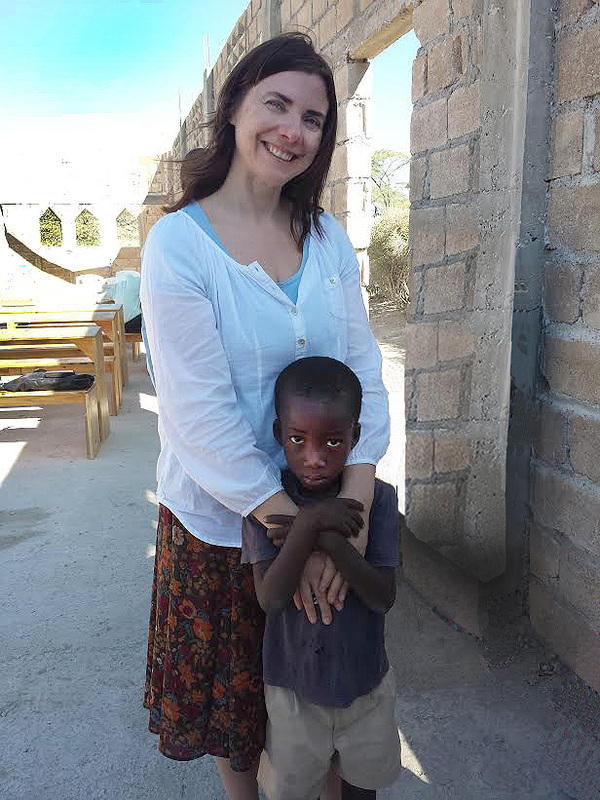 After prayer and consideration, Tanya (our coordinator) got in contact with Tonya (the W&W coordinator in Haiti) and together they looked at possibilities. Decisions were made to go to Docine; a small village just outside of Gonaives, Haiti. This would be our main project site. 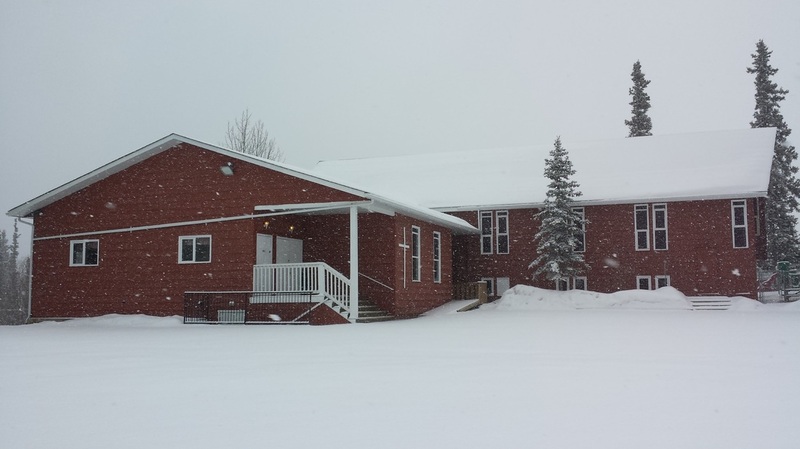 Here, we would work at a church that also operated a school. 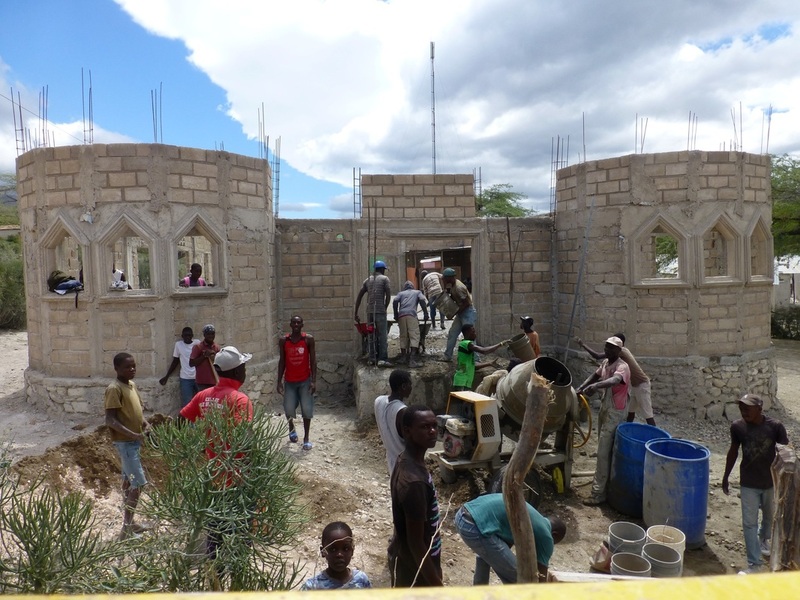 We would furthermore work at a small orphanage in another community at Petit-Goave. Several people in Whitehorse asked us what we would be doing, and for the most part, our answer was “we’re not entirely sure”! We quickly learned that flexibility is a hallmark of a successful work & witness team. Yes, we would be flexible! There would be ten of us from Whitehorse and one from Kelowna. 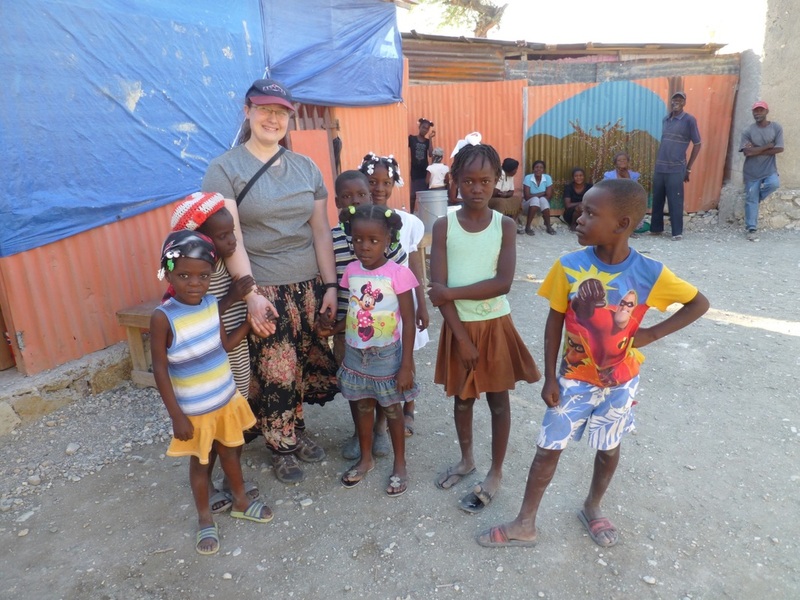 We left Whitehorse the morning of March 9 and arrived in Haiti the following day at noon. 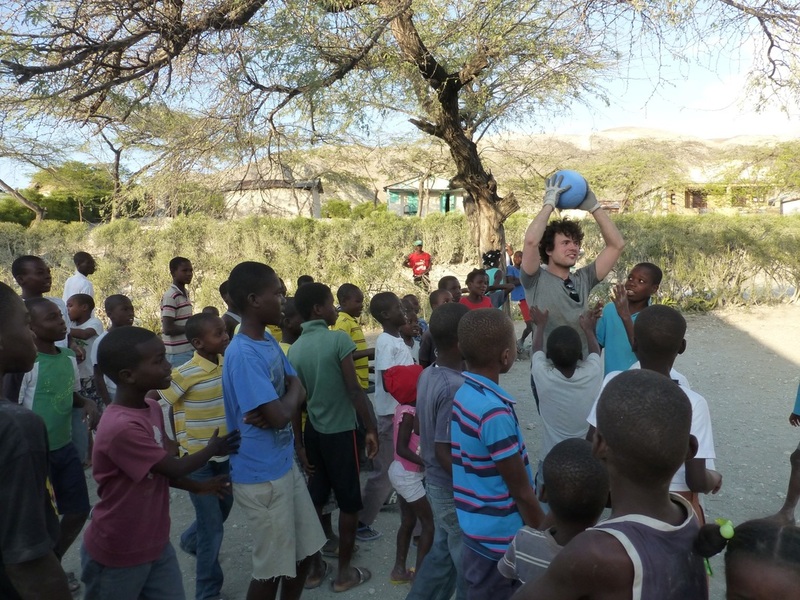 Upon arrival, and after completing the various checks at the Port-au-Prince airport, we went outside to be swarmed by a crowd of people wanting to take us here and there, carry our baggage, and who knows what else. But as expected, our hosts were there with their drivers to hustle us through the crowds and into what we would affectionately call the “cage truck”. 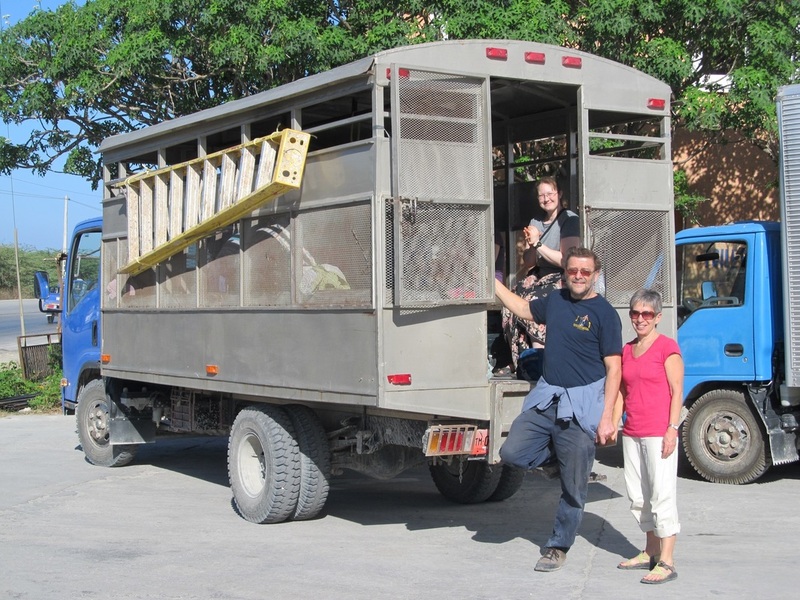 The cage truck was a well ventilated lockable box in order to keep the occupants safe through the streets of Port-au-Prince. While we had no security issues whatsoever, our hosts were very mindful of the possibility of danger and took every precaution to make sure we were safe and sound. Driving in the back of the cage truck was an experience in itself – especially after being confined to tight spaces in airplanes for the previous 24 hours. It was like we were all children once again! We had a blast, going up and down the streets, looking at all the sights, hearing the horns, and occasionally smelling the garbage. There was one particular hill that made the ride seem like a roller coaster. When our hosts weren’t directly behind us, I’m sure the driver of the cage truck took a little more “artistic license” in giving us an experience. Driving in Port-au-Prince is an experience. At first it seems like chaos and dangerous. It is dangerous – but only if one doesn’t understand the way traffic works in Haiti. The driving was aggressive, put it was a very considerate aggressive. In other words, people pulled out to pass others all over the place. Double lines meant nothing at all. However, people in the oncoming lane would make room. If it was impossible to pull over and make room, the oncoming driver would slow down just enough for you to get by the car you are passing. If you were passing a car, you wouldn’t dare slow down because that would eliminate your chances of getting through. Yes, it was aggressive driving – but a very considerate driving. At the end of the day, everyone wants to get home in one piece. 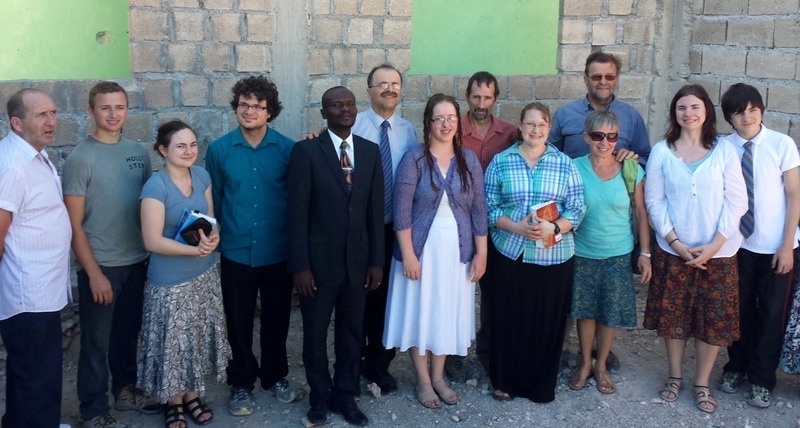 After our initial drive from the airport, we arrived at the Nazarene compound in Petionville. It took about 45 minutes from the airport. The Nazarene compound there covers about 35 acres and was purchased at a time (1950’s) when there was nothing else around. Now, it was surrounded by narrow streets. 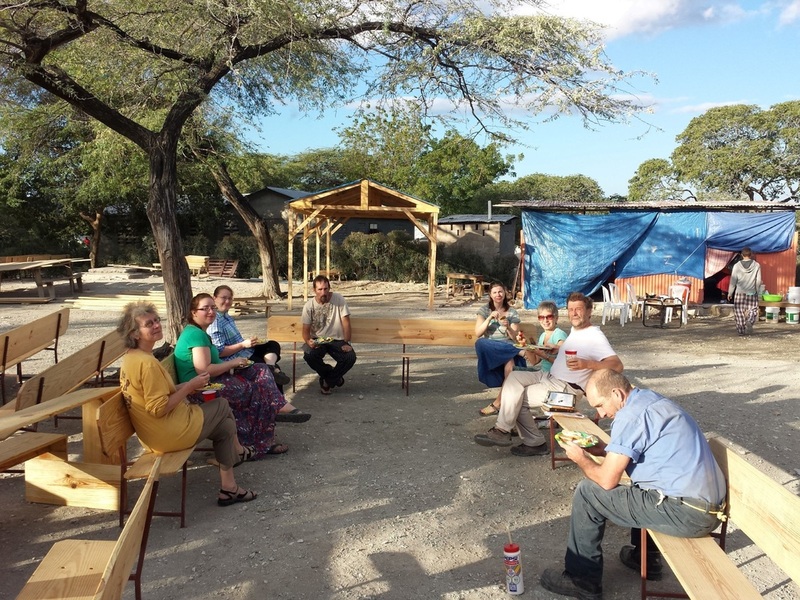 The compound had the Guest House for the Work & Witness team (and coordinators and cook). There was the seminary there. An administration building. Dorms for men, dorms for women, a cafeteria for the seminary, a clinic open to the public, and various buildings that contained housing for some of the staff and missionaries. It was quite a complex. There was also a huge (1500 seat) auditorium (roofed, but with open sides) that was used for special occasions by groups. 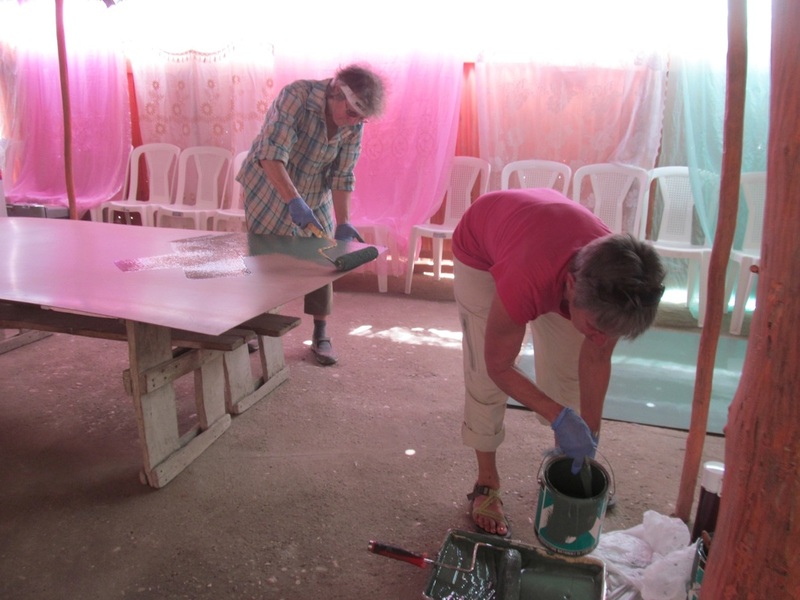 And most importantly for us, there was a huge workshop with all manner of tools and supplies. Once we arrived at the Guest House, we were greeted by the support staff; our cook, driver, translator, and one or two other individuals who would be involved. The guest house had a men’s section (complete with its own washroom and showers) and a women’s section (with its own washroom and showers). Upstairs was the coordinators residence (Tonya & Darin). On the main level was the cook’s residence. Our cook was affectionately known as “mama”. She had a bright smile and an amazingly warm servant’s heart. She loved to serve us and she did it so well. We were well taken care of. We had arrived at the guest house Tuesday afternoon and took the rest of the day to rest from our trip and get acquainted with our surroundings. In the evening, Tonya gave us information that we would need during our stay. We were always well informed and very well taken care of. Wednesday we began to work. 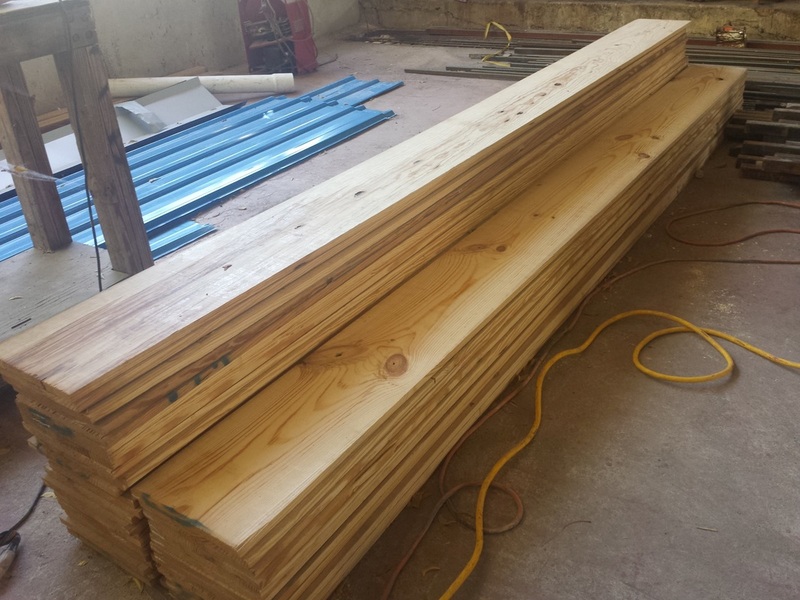 We had a large supply of pine boards that needed to be cut in order to eventually be made into school desks. These boards were sanded, cut, and stacked. Those who were not involved in this were at an office building (that another team had built) where they were doing some painting inside. Still others were involved in gathering tools and supplies that we would need at our first project site. By supper time, all the wood was cut and stacked, all the supplies had been gathered and all that was needed was to load up the truck. Besides the cage truck, we would also take a box truck (to hold all the supplies) and a pickup truck (to carry fuel for the generator as well as some other supplies). After dinner we filled up the trucks with all the necessary supplies. There was much to load. Besides all the building materials and tools, we also had to have all our camping gear. Cots, pillows, towels, toilet, tents, all the food we would need and all our kitchen equipment and supplies. We would also bring two giant coolers filled with large blocks of ice. We had to have everything we could possibly need as we would be going far out of town and we didn’t know what there would be available. Basically, we had to be prepared for the worst. Early the next morning, we put all our passports away (left them locked at the guest house) and boarded the cage truck. Off we went. The drive from Petionville to Port-au-Prince was about an hour with traffic. Soon after we left the other side of Port-au-Prince our convey of three vehicles pulled over. Darin (who was driving the pickup) had forgotten his driver’s license and since we would be driving past (or through) a number of police checks, he asked if any of us had our license with us. Many had left their license at the guest house, but Pastor Norman had his and was quite willing (somewhat naively) to drive. His experience of learning how to drive in Montreal came in handy and quickly adjusted to the driving methods of Haiti (white knuckles and all) and very grateful to the rest of the team who were undoubtedly praying for him. We arrived in Docine mid-afternoon and drove onto the church grounds. We were taken into what was a small classroom (large by their standards), where the children were seated in three long rows and we were brought to stand at the front of the class. We were very warmly greeted by the children singing a song of welcome. It was truly a delightful experience. They made us feel so much at home. Darin, our coordinator, responded with words of appreciation for their welcome. Next it was time to unload the trucks. It seemed like everyone within ten miles was there, eager to help us unload. It took no time to get all the supplies out of the trucks and to the work area. Mama had one very small room (a class room, if you can call it that) to set up kitchen. I’m sure she was a little anxious about trying to cook in that small area, with all the dirt and dust all over the place; but she did tremendously well. 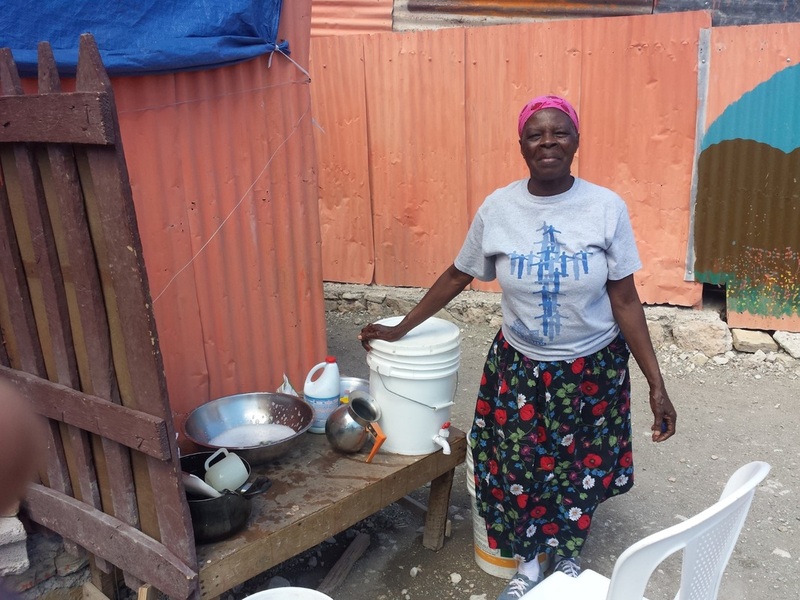 She set up a kitchen for herself and kept everything clean and sanitary. The building materials and tools were quickly put to use. We got to work right away, starting to assemble desks. Others were sanding boards that would become pews. Some used routers to put a nice edge on the boards. And still others started work on constructing what would eventually become a 12 X 24 kitchen. Before long it was time to eat. As always, we ate well. And just as it was getting dark, we headed back to the school room to set up our sleeping quarters. The room was divided off into two sections, one for the men and one for the women. We were relieved to find very adequate outhouses on the property. The church had also built two small shower rooms; one for the men and one for the women. They had really gone out of their way to try and make us comfortable. Once the room was divided off, we set up cots or air mattresses and slowly settled in for the night. Some used mosquito nets, others did without. The next morning (Friday) we were greeted by the sound of “BBQ” the rooster. Pauline named him BBQ because that’s what she wanted to do with this noisy beast. Actually, there were a few roosters giving us a song. In the mornings, Fred would led us in devotions. We would have breakfast and we would get to work. Friday we assembled pews and school desks. There were blackboards being built. And the kitchen was all framed and roofed. Somewhere along the way, a mural was painted (by Pauline). Throughout the day our young adults would slip off and interact with the kids, singing songs, dancing, and generally having a great time. The work was important, but interacting with the people, both young and old, was equally important. And we had plenty of opportunity. At one point early on the project, while Fred was trying to figure out how to bolt together pews with bolts that were too short (and just trying to get set up), he was surrounded by a group of kids who were there to "help". He very patiently allowed them to "help". 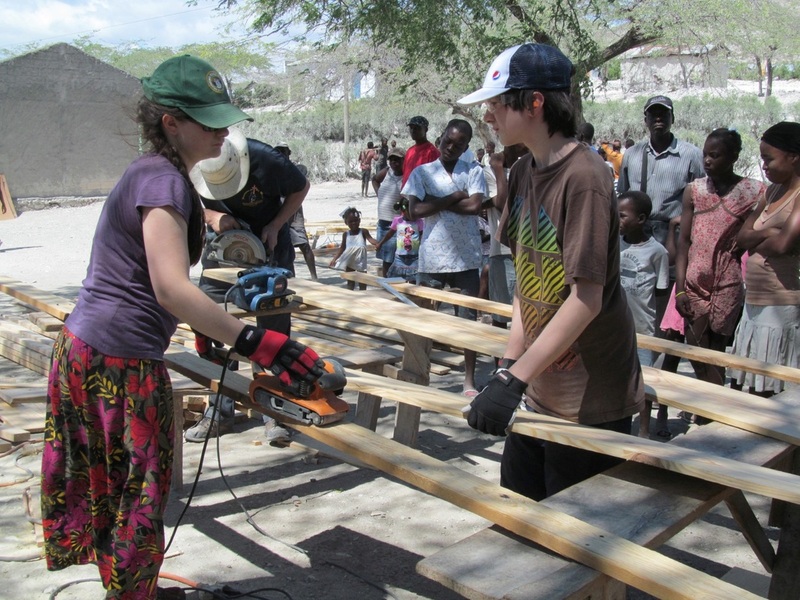 Eventually the kids moved on to other areas of the work site and a couple of Haitian men came and helped Fred assemble pews. It was amazing how quickly we were able to do so much work on Friday. We started to varnish the pews and desks Friday afternoon. Things were looking good! 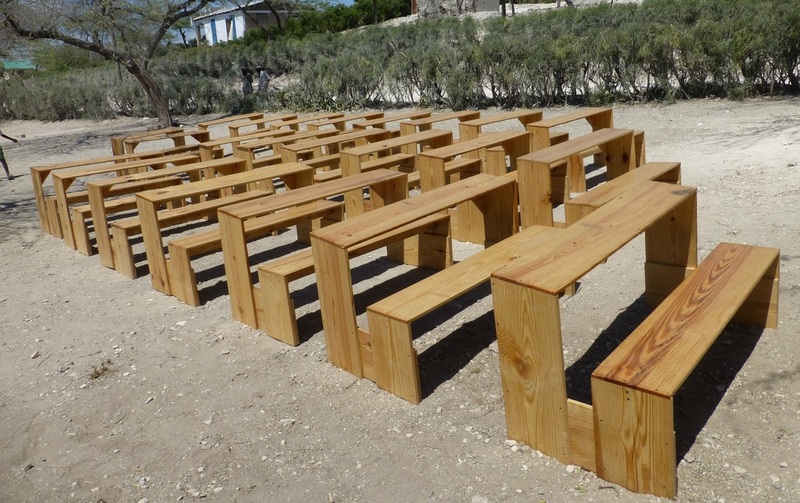 Saturday, after another rendition from BBQ, we had devotions on our new pews and set out to work. The desks needed a second round of varnish, along with the pews. The sides on the Kitchen were attached and a large work table was made for the kitchen. The local area teachers were given some instruction from Kathy. The blackboards were finished being assembled. By mid afternoon our work was complete! That gave us more time to enjoy with the children; including a nice long walk through the village. I'm sure by this point, the whole village knew something was going on at the church. They were all curious. Late Saturday afternoon we packed most of our supplies and equipment and loaded it into the box truck for transport home. Saturday evening, Sarkis and someone else hauled one of the pews into the church. By the time he came around the building to get the second pew, he found that all 20 pews were already moving into the church. Seems like they were waiting for someone to start the action! Later Saturday evening we assembled in the church, along with maybe 200 people from the community to wait for the showing of the Jesus Film. Once it was good and dark out, the Jesus Film crew arrived and while someone was leading everyone in singing, the crew set up and before long we were watching the film. There were kids all over the place, and many adults along the sides. I'm not sure how many went up for prayer after the film, but one of the boys sitting next to me did. I was amazed at how parents had let their kids stay at the church to watch the film late into the evening. There were some who didn't make it to the end of the film, but many did. As we were going to bed late Saturday evening, we were informed that they would hold church a little later than usual on Sunday morning. Since we were visiting, instead of holding Sunday service at 6 am, they would put it off until 7 am. Seriously? Yes, seriously. Wow. OK. Why not. Sunday morning, we had breakfast, loaded our personal belongings into the truck, and went for church. Church didn't actually start until closer to 8 am. Seems they had extra grace for us. There was some songs; a greeting from the pastor; our team leader (Tanya) was called up and given a gift (which we later opened and found to be a lovely painting with words of gratitude painted as well), and after some more singing, the local pastor invited pastor Norman to come and give a message, with the assistance of our translator, Absolu. Norman's message spoke about the toll that a heavy burden of sin can take, and how life changes when we are free from that burden. Of course, the Chilkoot came in during the sermon, as many of the stampeeders had to carry a heavy burden up and down the trail and what a difference it makes when you set that burden down. After the service, more photos were taken with just about everyone. It was kind of like at a wedding reception - people being photographed everywhere! Then we had the most difficult time of saying goodbye. Oh my, if we could have stayed, we would have. What an incredible experience in Docine. We headed out late Sunday morning, and stopped at a memorial site on our way back to the guest house. The memorial site is a place where many thousands of people who died in the 2010 earthquake were buried in a mass grace. The evidence of the earthquake (in the city) was still obvious, with many buildings showing broken (or missing) concrete walls. Back at the guest house, it was time for showers (ahhhhhh) and rest. We did have showers in Docine too, but it was kind of pointless, as you were covered in dust as soon as you went back to work. Even so, the showers at Docine were refreshing. At the guest house, we were able to clean up and do laundry and feel refreshed. I think Mama was happy to be in her kitchen again. :) Sleeping on proper beds was nice too! Monday we spent the day doing preparations for our next mini adventure. We cut and painted 2X4's and assembled trusses. In the afternoon we had a bit of time which was used to drive to a mountain-top lookout over Port-au-Prince. That was a nice (and somewhat adventurous) drive up the mountain. Gladly, we all stayed safe. Monday night we loaded the cage truck with the trusses, tools, and all manner of supply for the next day. Tuesday, bright and early, we split up into two groups. 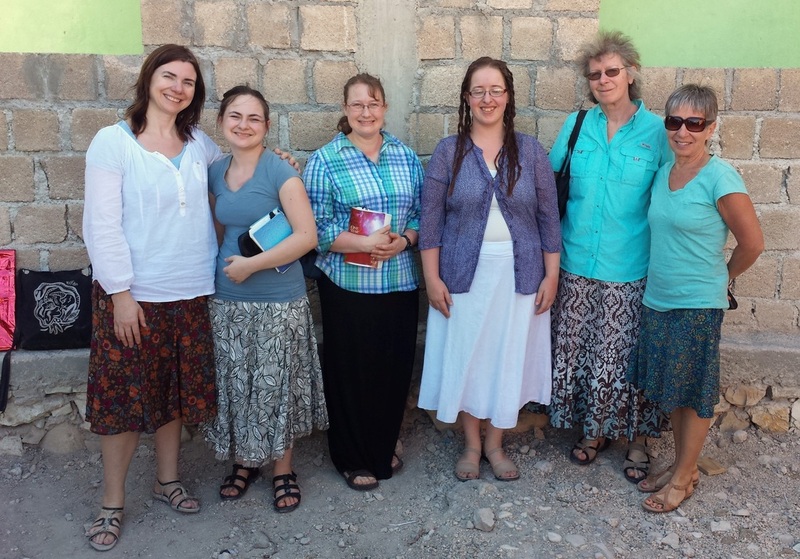 One group left the guest house for a 3 hour drive to Petit-Goave. This was a completely different type of place. It wasn't a large property. There was a bit of vacant land and a small building. I believe the building was an orphanage. 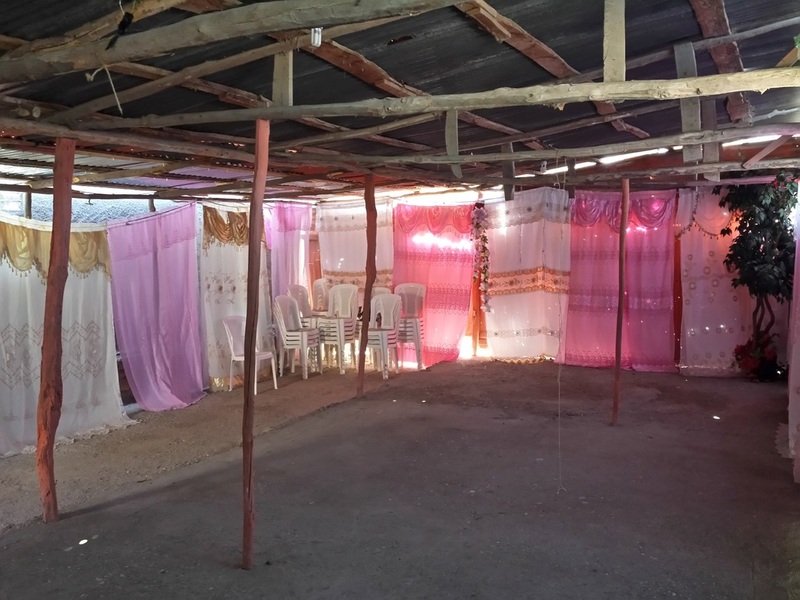 We built a 12X24 structure (shelter) on the land that would serve as a "patio church". It didn't take us too long to do; but once again, we were greeted by local people who helped unload the truck, hold ladders, and help out as they could. And here too, we found the children to be kind and friendly. Wherever we went, the children just stole our hearts. 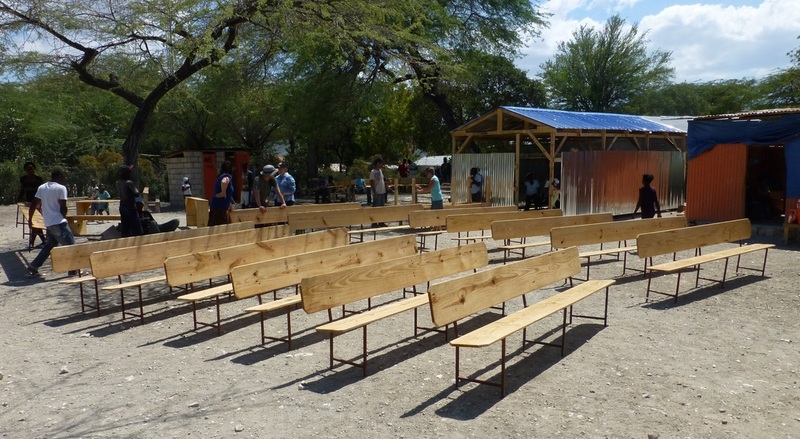 By late afternoon our project was complete at Petit-Goave. We prayed together, said our goodbye's and headed back to the Nazarene compound at Petionville. 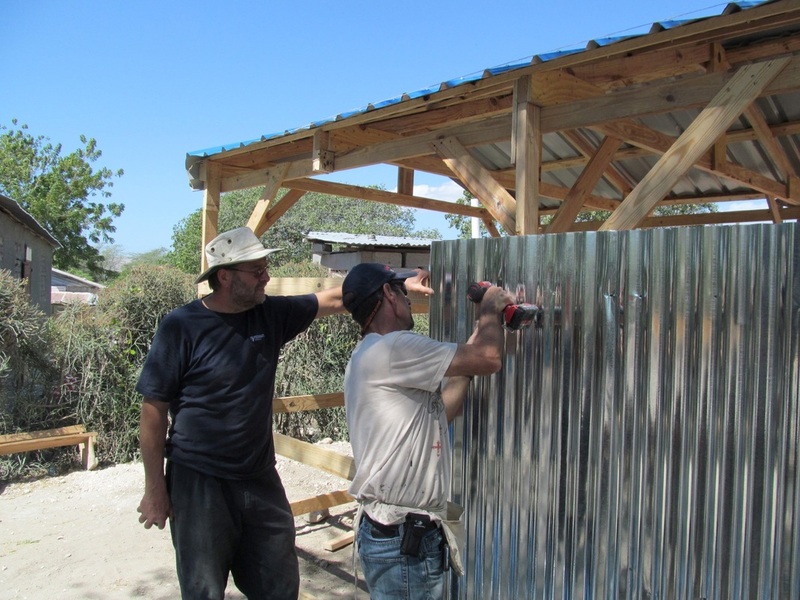 While one group was at Petit-Goave, the other group stayed at the Nazarene compound and finished working on that office building, sanding and painting the walls and making it look sharp! They spend pretty much the whole day there and didn't finish until just before the other group returned. Wednesday was our "tour day". Seven from our group went to a beach resort and enjoyed what seemed like a very comfortable beach experience. Everyone had a great time, except for Mr. Lobster which Sarkis had ordered. Poor thing. tsk tsk. Apparently he tasted good. The others from the group stayed at the guest house and assisted Mama with grocery shopping and meal preparation. The Wednesday night meal was an extravaganza. There was a wide variety of Haitian foods prepared. Poor Mama (and Lois & Kathy) worked all afternoon and into the early evening preparing this meal. It was a treat! 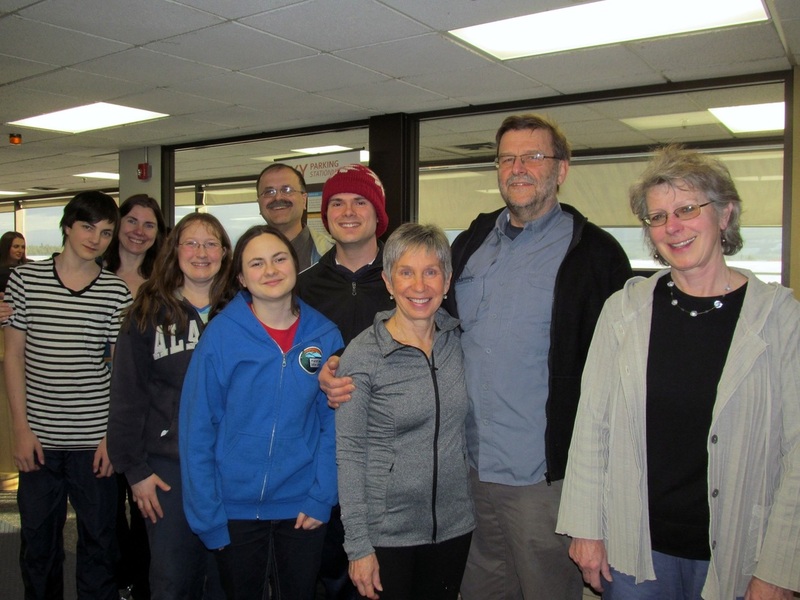 Thursday morning, we had to say goodbye to Fred & Kathy, who were heading out to another mission in Haiti for a day. Later in the morning, we said our goodbyes at the compound (it's was too hard to say goodbye to Colson, our driver), and headed to the airport. Once again, we had to get through the crowds at the airport and into the line for checking in. Everything went smoothly at the airport and before we knew it, we were on our way home. We did have to say goodbye to Lois at the Port-au-Prince airport, as she was heading off in another direction. Eight of us took off from Haiti together. The eight had an overnight stay in New York city, five of which took a cab to downtown and enjoyed the lights of Time Square. The others hit the sack early. Friday morning, we caught the early shuttle to the airport and continued our travels. We had to say goodbye to Paul in Vancouver (as he was returning to Kelowna). It was difficult to say goodbye to Paul. We came to know him and love him in the short time we worked, prayed and worshipped together. He promises to come visit us in Yukon soon. We arrived back in Whitehorse, around 11 pm on Friday night, March 20, greeted by several people who had come to give us rides home. We were tired (actually, exhausted) but so grateful to have gone on this trip. Yes, this trip has changed our lives. It's difficult to not be impacted. Their warmth, genuineness, openness and trust are to be commended, particularly when they have so little. We in Canada have so much, and yet in some respects we live so poorly. They, in Haiti, have so little, and yet they have a rich life. Strange how it works. Would we go back? If the opportunity is there, we most certainly would. Gladly. What next? Well, we did fund the cost of having the local people pour a concrete floor at the church in Docine; but they have no roof. 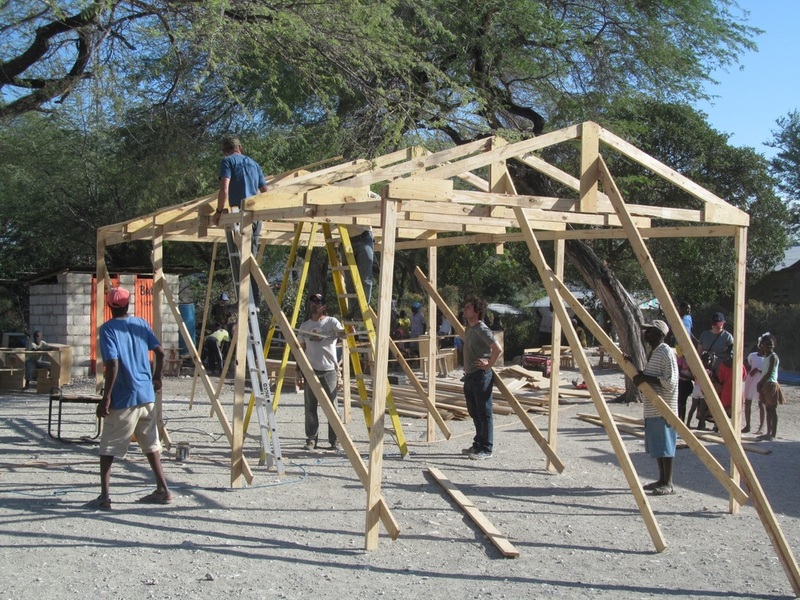 It would be wonderful if our congregation can "raise the roof" for Haiti. Early estimates were that it would cost $12,000 for the entire roof. This was not something we thought we could do, but we wanted to help. We collected an offering one Sunday and raised around $300. The next week, we had learned that the people in Docine had raised $2,000 on their own. That was virtually a miracle (actually, it was a miracle) so the following Sunday we put out a challenge to the congregation. Within 24 hours $6,000 was raised and the church added $5,000 from it's general fund. Before the end of that week, we had $11,000 on it's way to Haiti! Last we heard, the materials have been ordered. To God be the Glory.